How the Neolithic people found their way to Europe has long been a subject of debate. A study published June 6 of genetic markers in modern populations may offer some new clues. Their paper, "Maritime route of colonization of Europe," appears in the online edition of the Proceeding of the National Academy of Sciences. Between 8,800 to 10,000 B.C., in the Levant, the region in the eastern Mediterranean that today encompasses Israel and the West Bank, Jordan, Syria and part of southern Turkey, people learned how to domesticate wild grains. This accomplishment eventually allowed them to abandon their lives as nomadic hunter-gathers and become farmers. Archeologists use this transition from hunter-gathering to farming to mark the end of the Paleolithic era, or Old Stone Age, and the beginning of the Neolithic era, or New Stone age. Archeological evidence indicates that by 7,000 B.C. Neolithic farmers had moved into Europe. They introduced their ideas and genes to the native Paleolithic people, who had migrated into the continent 30,000 to 40,000 years before. The transportation methods and travel routes the Neolithic used have long been questioned. Did they travel overland, by migrating first north from the Levant into Anatolia, a region that is now central Turkey, across the Bosporus and then on through the Balkans into central Europe? Or did they travel by sea? And if so, by what route? Did they travel directly from the coast of Levant to Crete and then across to Greece, as one theory holds? Or did they first travel north into Anatolia and then island hop from Turkey across a large group of islands, called the Dodecanese, to Crete and, from Crete, on to Greece and Europe? To try to find an answer to those questions, an international team of researchers led by George Stamatoyannopoulos, professor of medicine and genome sciences at the University of Washington, looked at genetic markers found in 32 modern populations from the Near East and North Africa, Anatolia, the Aegean Islands and Crete, mainland Greece, and Southern and Northern Europe. 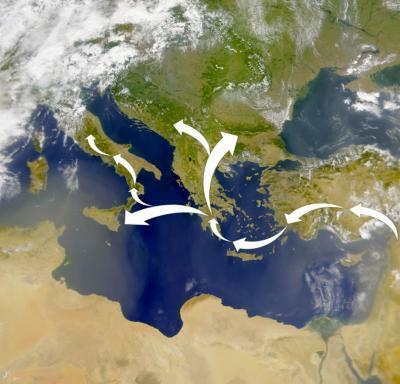 Genetic markers in modern populations indicate the Neolithic migrants who brought farming to Europe traveled from the Levant into Anatolia and then island hopped to Greece via Crete and then to Sicily and north into Southern Europe. In this study, Stamatoyannopoulos and his colleagues compared the proportion, or frequency, of certain markers, called single nucleotide polymorphisms, (SNPs) or "snips," appearing in these different populations. When a migrating people moves into an area and intermixes with the local population, they introduce their genes into the native gene pool and acquire genes from the native peoples. This introduction of genes from one population to another is called "gene flow." As subsequent generations continue the migration and the gene exchange is repeated again and again, the frequency of SNPs in the migrating population will reflect this genetic mixing. It is detectable in the populations they left behind. In their study, the researchers hypothesized that the Neolithic migrants to Europe had primarily travelled by sea. They tested their hypothesis by comparing the frequency of the SNPs in populations that now inhabit the Levant, Turkey, the islands of the Aegean and the Mediterranean and Europe and North Africa. The results of their study are being published online today, June 9, by the Proceedings of the National Academy of Sciences. The analysis confirmed the Neolithic migrants arose from the Levant. They then appear to have migrated first to Anatolia in central Turkey, across the Dodecanese, to Crete and then to Laconia at the southeastern tip of Greece. As the migration continued, some populations moved north into northern Greece. but the bulk of the migration continued west to Sicily and then to the Mediterranean coast of Southern Europe and into Northern Europe. "There were multiple migrations of Neolithic people into Europe and some, no doubt, went by the land route, but the predominant route was through Anatolia and then by sea, with Crete serving as major hub," said Stamatoyannopoulos. Although it was not the main focus of their study, the researchers also looked at the gene flow in populations in the Arabian Peninsula and North Africa. They found that migrations of Neolithic people originating from the Near East also moved southeast into Arabia and through what is now Egypt and across the North African coast. There was no evidence, however, of gene flow across the Mediterranean between Africa and Europe, This observation suggests that, although the sea allowed migrants to move along the coasts, it created a formidable barrier between the two continents. The findings also address older controversies: whether Neolithic culture spread primarily by cultural diffusion, in which ideas move from population to population through cultural contacts, or whether the ideas were are carried by migrating peoples, called demic diffusion, from the Greek demos meaning "people." "While cultural diffusion certainly took place," Stamatoyannopoulos said, "These findings strongly bolster the demic diffusion hypothesis."